It has now been 12 years since we successfully mapped the human genome. We now have a cellular-level model of the human brain. And I just read yesterday that they restored a guy’s severed hand after grafting it to his leg. Biology has come a long way. So, why can’t scientists agree on something as simple as which foods make us fat? If it’s just a question of determining whether the cause of obesity is fats or carbohydrates, shouldn’t science have a pretty clear answer by now? It should, unless it’s not our food that’s making us fat. Some of the latest research on obesity shows there may be factors involved that are unrelated to diet. Gut bacteria is now known to play some role, and some studies have even linked obesity to viruses. However, the factor that has received the most attention lately is obesogens, environmental pollutants that cause us to put on weight. Here are some graphics showing just how much our bodies have changed over the last few decades. Click on the map to stop the animation. I’m old enough to remember the 80’s, and I don’t remember the food being all that much different from today. Yet, the average person of my current age and height is a full 30 pounds heavier today. The concept of air pollution making us fat sounds crazy. But the idea that such a change has been caused only by food may be even crazier. What does the U.S. government have to say? Sadly, despite having been thoroughly disproved by science, and by American waistlines, the government continues to stick to its story. Obesity data by state is from the CDC Behavioral Risk Factor Surveillance System. Because of a methodology change in 2011, the comparison between pre-2011 and post-2011 figures is not exact. Average adult weight is from CDC Body Measurements and a report from the New York City Department of Health. Dress size sizing standards are from the National Institute of Standards and Appeals (1958, 1970) and ASTM International (2001 , 2011). The practice of labeling clothing smaller than its actual size is known as vanity sizing. Previous Article How Many U.S. Cities Can You Fit Inside Tokyo? How Much is 70 Hot Dogs? Results from Nathan’s 4th of July Eating Contest. Calories are not that much of a problem if your work them off. 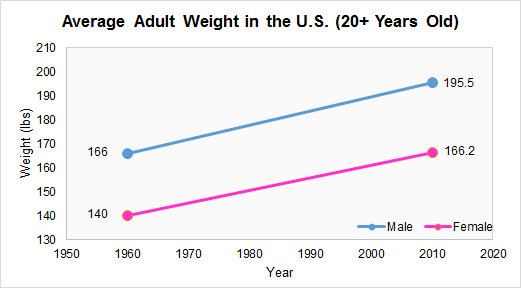 Driving more probably correlates with weight gain. If you compared VMT – vehicle miles traveled in each state over the same period, I’d expect you’d find correlations. Both will be up. Guess who’s getting fat the slowest? Colorado: where active folks love the million outdoor sports, and sedentary folks can’t handle the thin air and head back to sea level. I live in San Francisco where, unfortunately, despite the fact that myself and many others would like to be active, the parks and the roads are ruined by the disgustingly sick ones either driving insanely or having their dogs overrun what few parks exist here. In other words, this city wants people to be fat and disgusting. Join the Dolphin Club at the foot of Hyde St and swim in the bay. Or row the clubs boats! Bay swimming is wonderful. Hike on Mt Tam, also wonderful. If it were easy to lose weight, then everyone would be a size 0, because Americans spend $$$$ on diet programs, exercise, etc. I have a problem with perpetuating the idea that everyone in the past was wafer-thin and that across-the-board obesity is a modern phenomenon. In some stores, I’m a size 0. in others, I’m a size 8… some of my jeans are a 26, others are a 29…. who can figure it out? I’ve given up on looking at the sizes. if I try it on and it fits? perfect. the sizes don’t even mean anything anymore. 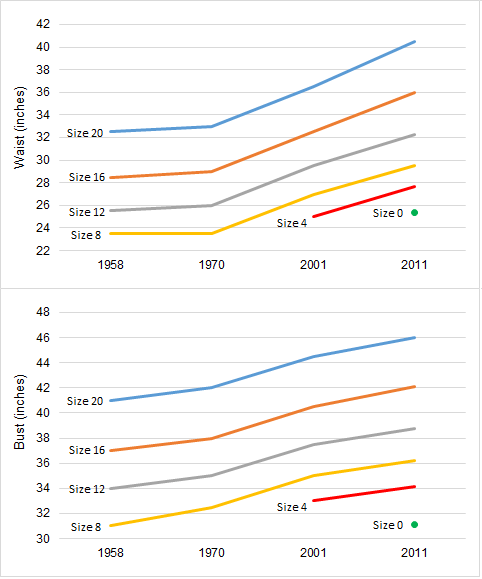 Curious if obesity figures are correlated with economic growth & decline. Another aspect of that being eating as a coping mechanism for stress & hopelessness. Interesting question. Just looking at the most obese countries (U.S., Canada, U.K., etc) I would be shocked if they were not strongly correlated. I’m sure having more junk food plays a role, but the stress is also a good theory. Sounds crazy, but several studies are now showing obesity may also be linked to chemicals in our environment. Do you think median would be a better measure? I guess the 1000lb outliers wouldn’t make that big of a difference depending on your sample size. I have a hard time buying into the pollution argument- wouldn’t professional athletes be less athletic? Seems like records are routinely broken and the quality of any sport is better than it was then. I believe that wouldn’t happen as much if there was some “fat-flourocarbons” floating around. I think portion sizes and the 24/7 availability of handheld entertainment and communication are the culprits. I enjoy your candid writing and infographics. No, I wouldn’t put my money on air pollution being the cause either. I think the biggest factor is probably our diet. But it wouldn’t shock me if obesogens, in some form, end up being part of it too. Either way, the point about athletes is an interesting one. While the obesity rate has climbed, the pool of potential athletes has shrunk. Yet somehow the talent coming out keeps getting better. I concur! +1 subscriber here. Maybe I missed it, but the sedentary computer work age has something to do with it, no? Combination of many things … From the rise of good/cheap media (TV shows, Movies,Video Games) to consume. Cable TV and Video Games brought a whole new era of kids sitting around watching TV after school instead of out riding bikes. Also this same era brought in affordable TV’s where families could own more than one TV allowing kids to sit around more. Also this time brought in the era of women working, meaning they were more stressed and started substituting quick and easy meals in place of real vegetables/meat. These new life styles are passed on from generation to generation… they are learned traits…. it snowballs. My memory goes back as far as the 60’s and 70’s, and it is correct for the most part that the food selections themselves aren’t much different. But what I can point to, unequivocally, is the portion sizes. I’d say that in some cases portion sizes have easily doubled, even tripled. 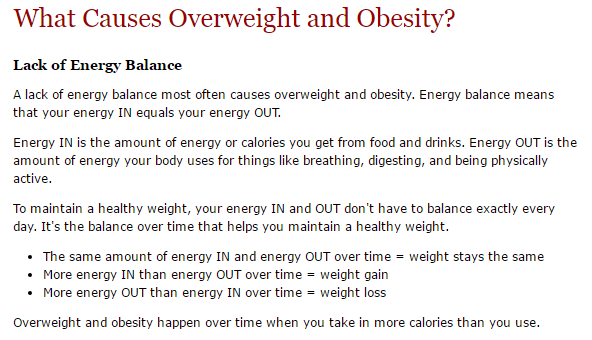 Especially in restaurants, and since more people are getting their sustenance on a daily basis from restaurants (many as much a 2 meals a day) it’s no small wonder that the “calories in/calories out” equation has been blown out the window. Most places I get a simple sandwich these days from a Deli or restaurant and it literally gives me 3 meals. Yet I see many who put those same sandwiches away in one sitting…..without a second thought. Add to that the massive amounts of sugar/calories that those same folks are consuming in sodas, and you have an instant recipe for obesity (when we were growing up, soda was a rare treat. Now it’s become a staple for many). Personally, I think the “air pollution” thing is a load of nonsense. Now FOOD POLUTION on the other hand, I think may be a huge factor also. Our meats, vegetables and grains are loaded with more chemical pollutants than ever before in history (insectacides, herbacides, fungicides, etc). And as mentioned in the comments above, our livestock is consistently pumped up with antibiotics, growth hormones, and other chemicals. There is growing evidence that the residual antibiotics and other chems fed to our livestock may be killing off our internal gut microbiome (the good Gut bacteria) when we consume their meat. It is well known that these trillions of bacteria throughout our intestinal tracts that aid in digestion, actually consume 10% to 20% of the calories we eat! Kill them off, and eating 3 meals a day more or less equates to eating 4 in terms of the calories our bodies can burn off! Agree with you about the portions. My counter would be that people don’t necessarily eat more just because they have more food available. White Castle burgers aren’t any less fattening than McDonalds. Our bodies regulate how much we eat, not the other way around — at least that’s my view. Yes, the recent studies on gut bacteria are compelling. I didn’t mean to imply I think air pollution is the problem, just that obesity may have something to do with the chemicals in our environment, and they’re everywhere — in the air, the plastic containers we drink from, skin creams, toothpaste, medicines. It may have nothing to do with the food we eat (though, it probably does). Agreed. Probably way too complex of an issue to just point at one, or even two factors. I was born in 1952. We were encouraged to eat saturated fats (butter, pork crackling, fat on the edge of beef steaks) , eggs, and milk shakes. We ate meat and two vegetables (potatoes, peas, carrots, greens) for dinner, eggs and bacon for breakfast and nobody was obese (This was before 1975 in the UK). When Ancel Keys foisted his corrupt, cherry-picked, confirmation bias-supporting “science” on the Gullible McGovern, we wasted 30 years restricting nutrient-dense, appetite-satiatiing, non-insulin-provoking fats for non-nutrient (negative nutrient in the case of grains), non-appetite-satiating, insulin-provoking sugars and starches. Ironically, a less aggressive (more importantly non-American) real scientist, John Yudkin, in the UK, had shown that it was sugar, NOT fat, that was responsible for heart disease in the Western hemisphere. How different the world would be now. Science DOES have a good idea about what makes us fat. Big donors are causing politicians to suppress it. If governments admitted that carbs are the cause of obesity, grains producers would lose billions, likewise big Pharma. It’s a theme that was played out in “Jaws” where a few dead surfers was deemed better than losing the tourist industry and in “An Enemy of the People” by Henrik Ibsen, where it was better to poison a few tourists visiting a contaminated “health bath” than lose their tourist trade. Substitute “tourist trade” with “donations to PACs”.